My family and I have decided to be sustaining donors because the need is constant. I first started working with the Food Bank in 2012 because I wanted to make a difference in the area in which I live. While the issue of hunger is worldwide, it was very important to me to make a difference locally. As I sat down to dinner with my family every night it hit me hard that my kids’ classmates may not have food on their plates. Unfortunately, the numbers are there to support my fears. Over 190,000 kids in central and eastern North Carolina do not have enough money to buy food. In 2012, with the help of the great team at the Food Bank of Central and Eastern North Carolina, we planned and produced the first 24-Hour Telethon to accomplish three things: raise donations to help those in need, educate our neighbors on the hunger issue in our area, and inspire volunteerism. I went on to host what is now called FoodBank24 for the first 3 years and while I no longer host the event I am excited to contribute to the mission of the food bank in other ways. My family and I have decided to be sustaining donors because the need is constant. 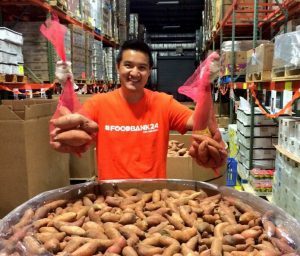 Sustaining donations help the Food Bank with daily operations and crucial programs that extend past just the efforts around the holidays. A sustaining donation is easy to set up and it warms our heart to know we help put hundreds of meals on the table every month for our local families. Hunger is not a short-term problem and neither is the solution. Food Bank CENC needs reliable, steady support to allow us to feed those in need every day of every month. Become a monthly giver today and join a community of supporters working all year long to help end hunger in our community. Every $10 donated to the Food Bank provides 50 meals. So a $30 monthly pledge would provide 150 meals for hungry friends and neighbors…every month. For less than a cup of coffee each day, you could be that special someone who is always there for a child, making a huge difference in their life. To become a member of our monthly giving program is simple, and because your gifts are automated, it means less work on your end and ensures that more of your donation goes directly to our program work. We could never do this important work alone!